This bit of news from France was posted on the “BBC” web site and forwarded to me by daughter Kathryn. I share it with you. Apparently, the young Fox, are not sly. 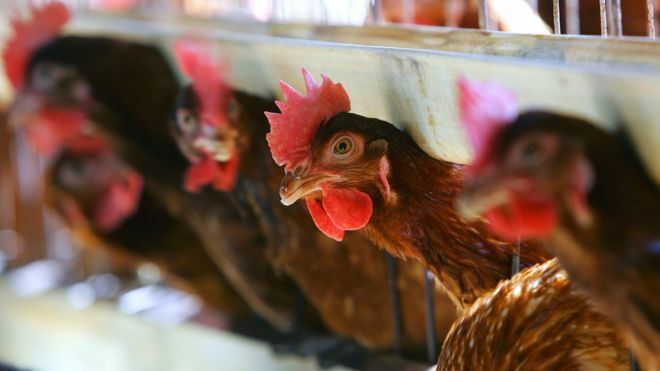 According to the farming school, hens, will easily confront an animal that lacks vigor. “There was a herd instinct, and they attacked him with their beaks,” said Pascal Daniel, head of farming at the agricultural school Gros-Chêne. The body of the small fox was found the following day in the corner of the coop. “It had blows to its neck, blows from beaks,” Mr. Daniel told AFP news agency. The farm is home to up to 6,000 free-range chickens who are kept in a five-acre site. The coop is kept open during the day, and most of the hens spend the daytime outside, AFP adds. Despite what you think, chickens are not stupid. When the automatic door closed, the fox – thought to be around five or six months old – became trapped inside. “A whole mass of hens can arrive together, and the fox may have panicked in the face of such a big number,” Mr. Daniel told the regional newspaper Ouest France (in French). Rather than go with Sam’s “A Day In My Life,” I’m just plagiarizing, with her permission of course, and shall call it “Captains Two,” plus the four Greats. That will be Mia, Ana, Dax and Zoe. Enjoy the kid’s travels while in Europe for the next few years. Upon getting home from my work trip I learned it was time to pick up one of our two tables we had ordered. The table we would be picking up was in Northern Netherlands, or Holland, and was our new coffee table. Kinderdijk was recommended to us by the man who built our table and we are so glad he did. The weather was perfect and the crowds were low. Dax and Zoe loved taking a vehicle ferry and then riding a boat to the windmills. One of the windmills we toured housed a single family of 14! Next was another castle. Though the baroness was Jewish it survived WWII thanks to the wits of the staff left behind. They hid anything that could be taken off the walls in secret passageways. If they received news of German troops coming close they would begin to clean and manicure the grounds. When asked what they were doing by German troops, the staff would respond getting the estate ready for your leadership. Thinking their leadership was about to arrive, they did no harm to the property. And finally it wouldn’t be a Davies Day Trip if we didn’t go out of our way to see Amsterdam and the dyke system that has reclaimed the lowlands of the Netherlands. Son-in-law hangs out Gunners door and captures this shot (pun) leaving Baghdad, Iraq a few days ago. By elfidd / The Rooster in Sharing, Travel, Where in the world on March 18, 2019 . Gangs are not pretty wherever they are. I didn’t think of it in that respect, but you are right. An exception being a gang of men with rakes as I get my yard and plant beds ready for planting and mowing. Enjoy those mountains Donna, how are the wheels? Vicious chickens and peaceful Holland! What a post! I enjoyed every bit of it. As did I! The photos are fantastic, the windmills in particular. Thank you, we hope to see them in person come December. So interesting about the staff saving place during the war. Catching up on your travels. How great to expose children to new cultures and distant lands! That is awesome. As far as the rooster defending itself, let be a (good) sign of the times!